The La Porte Educational Development Foundation put on its annual Turkey Trot 5K Run/Walk on Thanksgiving Day. The idea for the run came from Nick Otis, LEDF board member, and it has since become a Thanksgiving tradition for many. The Turkey Trot started off bright and early with registration at 7:15 a.m. and the race beginning at 8:00 a.m. This years’ event had an incredible community turnout. The Turkey Trot is for runners, joggers, and even walkers. It is also open to a variety of ages ranging from children to even grandparents. To participate in the event, everyone must pay a fee of $20. Each participant receives a shirt for paying the entry fee and trotting. Anyone participating in the event met at the La Porte YMCA on Michigan Ave. Starting at the YMCA, the Turkey Trot went down south Michigan Avenue through Beechwood Golf Course and comes to an end one block north of the YMCA on Michigan Avenue. Though the weather wasn’t chilly, it didn’t stop people from showing up in droves. “The weather was not the best, but during the trot we warmed right up,” Madisyn Ross, LPHS student, said. The temperature outside may not have been to the trotters liking, the warmth throughout the community was strong. The La Porte Educational Development Foundation is working to “Energize Education.” They raise money to help support teachers and students. “This gives back to the community through student scholarships and teacher grants to help in the classroom,” Holly Wireman, LPHS assistant principal, said. The Turkey Trot brings lots to the table and is serving up more than turkey on this day of thanks. The event gets locals involved and is also helping out others in the process. 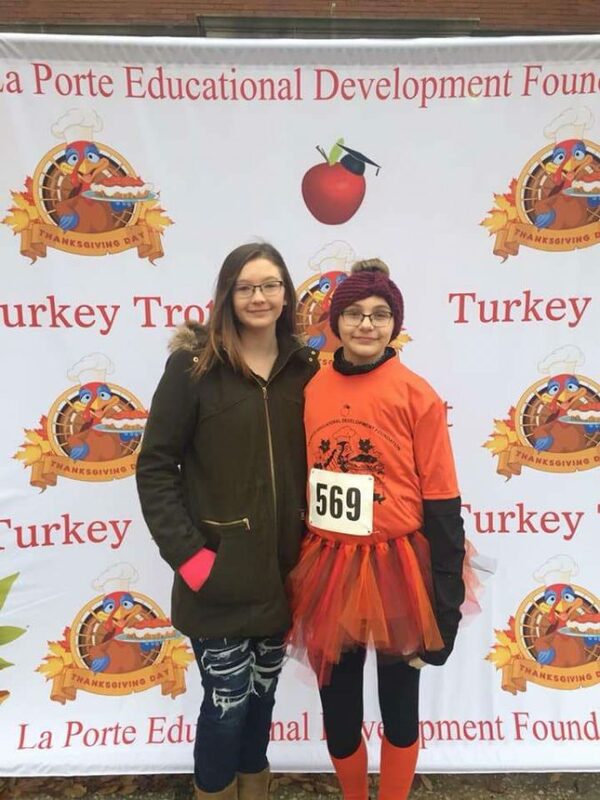 “I chose to participate in the Turkey Trot because I felt it was a good way to get involved and stay active,” Ross said. This turkey day annual event has had nothing but positive feedback. “People seemed to enjoy the event. I only saw smiles from everyone there… including the dogs,” Rachel Bellah, a GR volunteer, said. This was the Trots sixth year of the annual event and is the La Porte Educational Development Foundation’s biggest event of the year. The Turkey Trot’s positive feedback and all the benefits gathered from the event gives everyone more reasons to come and participate in the local Thanksgiving tradition.